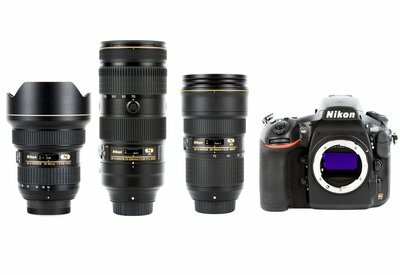 A high end kit including the very impressive Nikon D810 DSLR which is an underrated wedding camera. Sure you get massive files out of this beast but the tradeoff is you have a lot to work with! In addition to the Nikon 24-70 f/2.8 and 70-200 f/2.8 lenses this package adds the ultra wide Nikon 14-24 2.8 zoom lens for the perfect combination to capture events as they unfold in front of you giving you the flexibility of getting those "story telling" wide angle shots and gorgeous portraits with creamy bokeh. This package is also fantastic for travel photography and basic portraiture. Feel free to add in other gear like a flash or extra CF or SD cards in the Accessories tab!